Housed in a building with a single terminal, Valencia Airport (VLC) is an increasingly busy facility, catering to those arriving in Valencia for both business and leisure purposes. 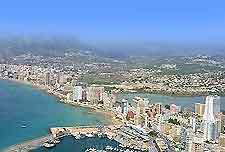 The airport is located around 9 km / 6 miles west of Valencia city centre and next to Alaquàs, Paterna and Torrent. Valencia Airport has seen rapid growth in passenger figures since the year 2000, currently serving in excess of five million passengers per year. Although the airport has two runways, most airlines only use the longest one, which stretches for almost 3,200 metres / 10,500 feet. In 2007, the Valencia Metro's Line 5 was extended to reach the airport and features regular trains to the city centre and also the westerly harbour. Sited next to the N-220 and the A3, Valencia Airport is easy to find and public buses run regularly to Valencia city centre between the hours of 06:30 to 23:15. Particularly popular is the shuttle bus service, which is known as the Aerobus and runs to locations such as the Avenida Reina de Valencia, the Avenida Menéndez Pidal, the Gran Via Fernando el Católico St. Ángel Guimerá and also St. Bailén. Taxis provide a more expensive alternative to Valencia Airport's public bus services, while hotel shuttles are often available free of charge and are a reliable, but slower method of reaching your accommodation. Rich in history, Valencia is Spain's third-largest city, with evidence of settlements in the area as far back as Roman times. Today, Valencia offers fine Baroque buildings and grand squares as well as remnants of both the Moors and the Visigoths who once called the city home. Close to the Mediterranean coastline, Valencia Airport (VLC) offers particularly scenic take-offs and landings. Significant attractions nearby include the magnificent Palacio del Marqués de Dos Aguas and the Basílica de la Virgen de los Desamparados. A number of museums are also worth a visit in Valencia, including the Museo Taurino, Museo de Bellas Artes, the Instituto Valenciano Arte Moderno, and the simply stunning Ciudad de las Artes y las Ciencias (City of Arts and Science). Alternatively, head to one of the city's impressive botanical gardens or fine parks to enjoy some nature.